If you've noticed a clicking sound when you open and close your mouth or feel like your jaw gets locked from time to time, you may have temporomandibular joint (TMJ) disorder. TMJ disorder treatment can help relieve the symptoms of TMJ disorder and improve quality of life. Jaw clicking and locking are some of the more common TMJ disorder symptoms. In this blog post from Redwood City, CA dentist Jean E. Barthman, we will focus on the many possible symptoms of TMJ disorder. The temporomandibular joint connects the jaw to the temporal bones of the skull, allowing the jaw to open and close, as well as move side to side. TMJ disorder refers to a condition in which the temporomandibular joint or the muscles responsible for controlling the movement of this joint do not work properly, resulting in a number of symptoms. While the exact cause of TMJ disorder is not known, it is believed that problems with the function of this joint arise from issues with the muscles supporting the jaw, the joint itself, or both. 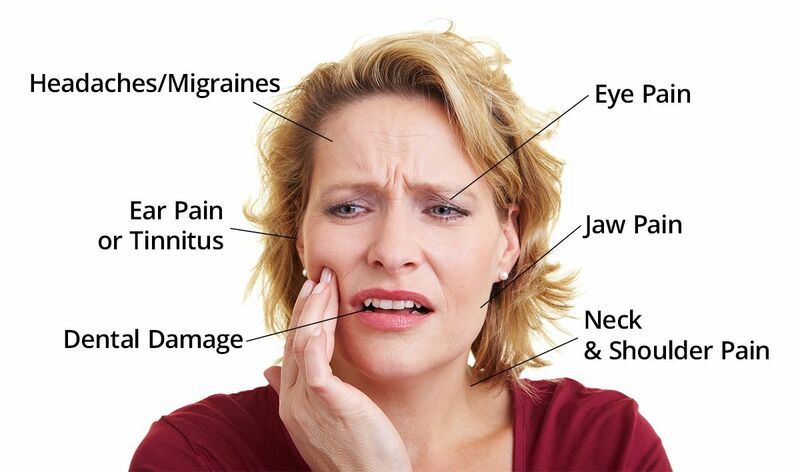 Pain: Pain is one of the most common symptoms of TMJ disorder. Pain may be felt in a number of areas in addition to the jaw joint, including the neck, shoulders, face, around the ears, or when eating or opening and closing the mouth. Clicking sound: Another common symptom of TMJ disorder is a clicking sound when opening and closing the mouth. This clicking may also be described as a popping or grating sound. Difficulty opening the mouth: Those with TMJ disorder may have difficulty opening the mouth, especially when trying to open the mouth wide. Difficulty chewing: TMJ disorder can make it difficult to chew or bite, often as a result of pain or difficulty moving the jaw. Jaws that feel locked: With TMJ disorder, the jaws may feel locked or stuck in an open or closed position. Facial fatigue: Some TMJ disorder sufferers find their face feels tired. Facial swelling: The face may swell on one side or both sides when TMJ disorder is present. Aches: Some other symptoms of TMJ disorder include headaches, neck aches, earaches, and toothaches. Hearing issues: In some circumstances, TMJ disorder can lead to hearing problems, including tinnitus, or a ringing in the ears. Dizziness: Some people may feel dizzy due to TMJ disorder. If you suspect you have TMJ disorder and want to know more about your treatment options, you're encouraged to schedule a consultation with Dr. Barthman today.